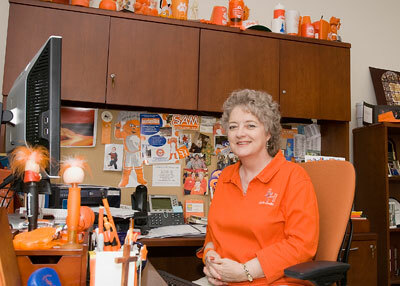 Chandler, an East Texas State grad who "got here as quickly as (she) could," has filled the Undergraduate Admissions office and Visitor Center with the Bearkat spirit for more than 25 years now. She will retire May 31. Sam Houston State University will lose its biggest "orange promoter" when Visitor Center director Joey Chandler retires May 31. Chandler, who celebrated her 25th anniversary at SHSU last week, has been a part of the university’s enrollment growth since 1984, when she joined the staff as the assistant director of admissions to help coordinate the recruitment effort. Chandler was named director of Undergraduate Admissions in 1992, and in 2005, the first year the university’s enrollment reached 15,000, she was named director of the Visitor Center. Since then, Chandler has also witnessed growths in two of the center’s biggest programs, with both Saturdays @ Sam and the number of campus tours given annually. Of all the things she’s worked to accomplish in her 25 years at SHSU, Chandler said the growth she’s helped the university to achieve is among her proudest. “That’s certainly a team effort, everybody contributes to that,” she said. “I really enjoyed helping set up the Visitor Center, from the groundbreaking and opening day. Though she’s not an SHSU alumna—she graduated from East Texas State University in Commerce with both her bachelor’s and master’s degrees—Chandler, who joked that she got here as quickly as she could, has developed a reputation across campus for being arguably SHSU’s biggest promoter of school spirit. Among her plans for retirement include traveling to see her two-and-a-half year-old grandson in Georgia, as well as spending time with family and friends in Dallas and continuing to work with the Huntsville-Walker County Chamber of Commerce and on the board of trustees at Alpha Omega Academy. Bearkat alumnus Clint Lockwood, who has worked in Enrollment Management since 2006, has been named Chandler's replacement. “Growth will be in Huntsville a while,” Chandler said. “I’m looking forward to being a part of it. A retirement reception will be held in Chandler’s honor on May 28, at 2 p.m. in Austin Hall. Enrollment Management counselor Clint Lockwood has been named as Chandler’s replacement. His official start date is June 1. 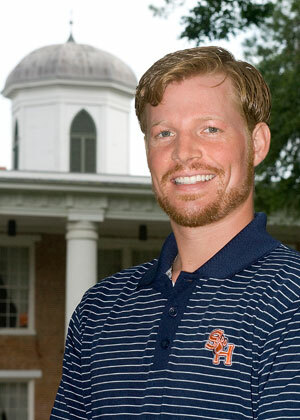 A Bearkat alumnus who earned his Bachelor of Business Administration degree in 2005, Lockwood started working at SHSU in 2006 as an undergraduate admissions counselor. In September 2007, he assumed his current role in the Enrollment Management division, for which he is in charge of operating the Go Kats Go Center. In addition, he is currently pursuing a Master of Science degree in higher education with an emphasis in enrollment management from Drexel University in Philadelphia, Pa.
“I am extremely happy to have been chosen for the position and know I have some pretty big shoes to fill with Joey Chandler retiring,” Lockwood said. The Go Kats Go Center will also join Lockwood in the move, which will “maximize the resources available in the Enrollment Management division,” he said. “The combined resources and functional fit of the departments will create a greater synergy for SHSU to continue attracting and enrolling prospective students,” he said. Chandler said she thinks Lockwood is a “very nice young man,” who “will do a fine job” as her replacement.